It�s a network color scanner, it�s a fax, it�s a network printer. Welcome to the world of cutting-edge imaging technology. The Panafax UF-9000 delivers more versatility, higher reliability, greater ease of use, and expanded network connectivity for your business. The UF-9000 s a network-ready MFP with automated network installation capability. Simply plug the cable in the uf-9000�s Ethernet port and the network information is automatically acquired. The UF-9000 allows users to scanner virtually any type of document directly from the flatbed scanner, turn it into a PDF, custom name it, and send it to a networked PC. 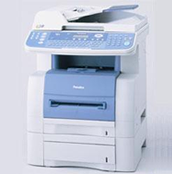 The UF-9000�s high-speed Super G3 fax with JBIG compression transmits at about 3 seconds per page. In addition to faxing capabilities, users will appreciate the UF-9000 even scans in color taking your business to the next level of document processing. The versatile UF-9000 sets the standards for network integration and provides the power of a big business office system in a single, compact, easy-to-use unit. The Network-ready UF-9000 links seamlessly through an Ethernet and/or USB interface enabling high-resolution prints at speeds of up to 19 ppm; making this powerful multifunctional device ideal for departmental and work-group users. The UF-9000 comes with features such as duplex printing/copying and N-in-1, making double-sided prints or copying multiple originals onto a single sheet of paper a snap! Document processing should be the least of your worries. For increased performance and productivity, the UF-9000 enables document management and document processing via the scans in color taking your business to the Panafax Desktop and Panasonic Document Management System (P-DMS) software. Additional features such as Security Print/Mailbox and Completion Notice enables performance of various functions without having to leave your desk. The Panafax UF-9000 measures up to the test. So put one to work for your business today.